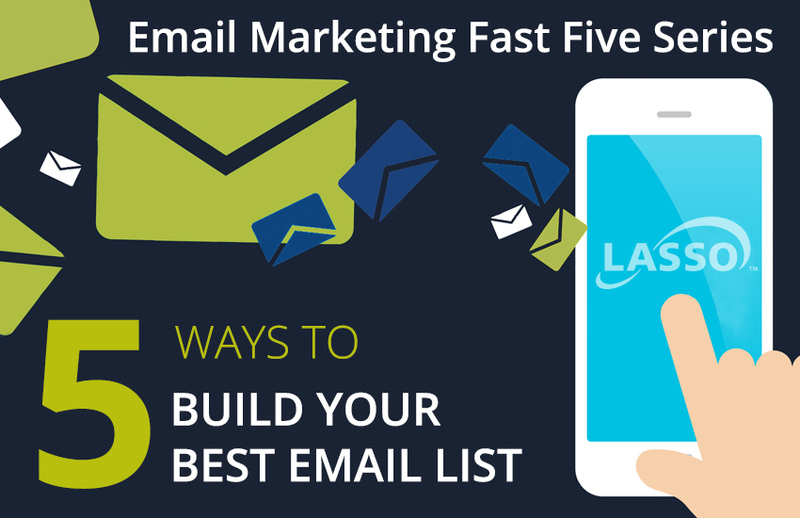 Lasso’s bi-monthly blog series, Email Marketing Fast Fives, explores best practices in email design, list management, and deliverability in 5 easy tips per article. 1. Start with effective calls-to-action (CTAs) and landing pages on your website. The job of your website is to draw visitors in with content and convert them to leads. Your CTAs should be action-oriented and attention-grabbing. Make sure your landing pages tell visitors exactly what they’re getting. Include a checkbox asking visitors if they’d like to receive future information from your company, such as a monthly newsletter (make sure this box is not pre-checked). 2. Make sure your recipients are opted in. This is now the law in Canada (CASL) and a best practice in the United States (CAN-SPAM). If your recipients’ emails are not opted in, start by sending an opt-in campaign through Lasso. 3. Create a list of recipients who have opened your emails in the past. These are your most interested prospects, and the ones most likely to take action on a future email. 4. Segment by prospect type. Prospects at different stages of the sales funnel will need different content. “A” rated prospects might need information on incentives or mortgage programs, while “C” prospects might be more interested in community amenities and home features. 5. Make sure emails are being delivered. According to Hubspot, email marketing databases decay by about 22.5% every year. Proactively check your email analytics report for failure reasons. Remember, it’s important to remove or correct emails that have failed to keep your lists clean and functional. Get more great tips like these every month – sign up for the Lasso Newsletter. Learn more about the email marketing through Lasso – the CRM for new home builders and developers.